I’ve been working on the Print and Play Gamer blog for several months now. At this point, I’ve got a pretty good idea of where it’s going and how it’s going to get there. I thought I’d take a few moments to share my plans for the site. Here’s an overview of the content I plan to bring you in the coming months. First off, I plan to offer as much free, downloadable game content as possible. Last week’s PDF of giant toadstool minis is just a beginning. I’ve got a backlog of my own miniatures and terrain to share, as well as a collection of really great figures from other (much better!) artists who’ve given me their permission to share their work as well. I also write brief supplements and gaming aids for my own table that you might find useful as well. Those I’ll share here as PDFs. Look for an original D&D 5e Paladin Oath I cooked up for my own PC in my friend’s Curse of Strahd campaign within the next couple of weeks. I’ll also offer tutorials for game-related papercraft projects. I’ve already shown you how to use GIMP to gather a collection of miniatures from separate sources and format them for printing. I still owe you the follow up tutorial, showing how to recolor figures, massively expanding your cardstock miniature collection. Down the line, I’ll show you how you can take images you collect online and turn them into unique printable miniatures. I’m also working on a series of papercraft assembly tutorials, focusing on constructing more difficult projects such as buildings, bridges, and other terrain. I have several suitable projects in mind, but I’m still trying to figure out exactly how to present papercrafting demos. I could write text tutorials and illustrate them with tons of photographs, but I’m thinking video tutorials might be better. If PnPG ever becomes a YouTube channel, crafting demos will most likely become the reason why. Last week, I posted my first overview of a published print-and-play game product, the wonderful Old School Renaissance ‘Zine, Black Pudding. This will be the model going forward for “reviews” in PnPG: in-depth examinations of downloadable gaming products that I have found especially useful and enjoyable. I’ll give you a good idea of what’s inside the product, and why it’s so special. I may even give you some insights into how I’m using it at my own table. You’re not going to find negative reviews on PnPG. There’s too much good stuff out there for me to waste my valuable time and yours griping about inadequate gaming products. Instead, I’m going to focus on telling you about the things I really like, with a heavy emphasis on works from independent creators and small publishers. You don’t need me to tell you whether the latest D&D campaign book is worth $40–dozens of bloggers and YouTubers are doing that already. I’m going to try to tell you about products you haven’t heard of yet, and why you might be interested in them. I’ll also mention the blogs I read and the YouTube channels I watch. There’s a ton of great gaming content online; the hard part is finding the sources that are worth your attention. We can all help one another by sharing links to content we found valuable. Whenever I recommend a blogger or YouTuber, let me know what you think of them in comments, or even better, direct us all to related high-quality resources. I’ll also share with you my own projects–miniatures I’ve collected and assembled, terrain I’ve built, and games I’m running or playing in. I’ve got literally thousands of figures and dozens of terrain pieces that I can share as soon as they’re photographed. I’ll show you what I’ve got, and tell you where I got it. In many cases, I’ll be able to show different takes on the same subject by several artists. For example, the next time I get my camera out, I’ll be photographing goblin miniatures from Okumarts, Printable Heroes, Paper Forge, and probably a few more artists. I’ve got them all (I’m a completist), but you can look at my collection and decide which version you like best for your table. I’m also prepping for a new OSR fantasy campaign which should kick off in a few weeks. I’ll be using a downloadable rules set, and building the campaign using a mix of original material and published setting and adventure PDFs from several publishers. I’ll share the house rules and campaign conventions, and give you a behind-the-screen look at how I’m weaving published and original material together to make a unique campaign. The point is not to showcase how things ought to be done, but how one ordinary gamer is doing it for his own table. I’m going to make mistakes, and when I do, I’m going to show them, too. My hope is that by seeing how I do it, you’ll realize that none of this is all that hard, and that you can do it yourself much better than I do! If you’re like me–and if you’re reading this, you probably are–you spend more time thinking about games than actually sitting at the table playing them. After all, to actually play a game, you need to organize a group of people to all show at the same place at the same time. To think about games, you just need to have something less interesting that you’re supposed to be doing instead. As a result, I’ve got a whole bunch of opinions about what I think makes a good game, a good campaign, a good adventure, or even a good gamer. From time to time, I’ll pretend that you care about what I think, and share it. Feel free to skip those posts, or to take up contrary positions in the comments! I’ll try to keep my personal rantings to a minimum, though, because I don’t think that’s what you’re really here for. At this point, PnPG is a very simple blog. So far, it just presents a variety of posts and lets you sort them to find the ones you want. As it PnPG takes shape, I’ll the add bells and whistles it needs in to better serve its readers. I haven’t even put a main menu in the header yet, because I haven’t been sure what it should include! Well, I’m pretty close to nailing down the list of essential pages, so you can expect a navigation menu soon. Beyond that, I hope to add Twitter and Instagram integration soon. The PnPG twitter account will notify readers about time-sensitive table-top gaming news, and announce new content on the blog. I’ll use Instagram to post pics of my mini collection, papercraft project works in progress, and live tabletop gameplay. I want to make it easy to follow PnPG on social media, and to make sure it’s worth following. I’m also trying to decide whether the site should offer subscriber memberships. Should I simply allow anyone to comment on posts, which means I have to review and approve each comment? Or should I limit comment privileges to subscribers, who could chime in on any post without my having to review each comment. Subscriber-level memberships would also facilitate email notifications about new content on the site, which would either be useful or annoying. Of course, all PnPG content will be free to everyone, and there would be no charge to subscribe. I’d like PnPG to become a community, not just a monologue, so please share your views in the Comments below. My plan at the moment is to post at least twice a week. On Tuesday mornings, I’ll post a short piece, perhaps a gallery of photos, a product recommendation, or an editorial. On Friday mornings, I’ll post a major feature, such as a page of downloadable miniatures, a papercraft tutorial, or an in-depth examination of a game or supplement I’ve found especially valuable. I’ve got enough material locked and loaded to be able to commit to this Tuesday/Friday schedule for the foreseeable future. There may be other posts in between, but the big stuff will hit by breakfast time on Tuesdays and Fridays. I do hope that PnPG evolves into a community of gamers who are printing, crafting, and playing. 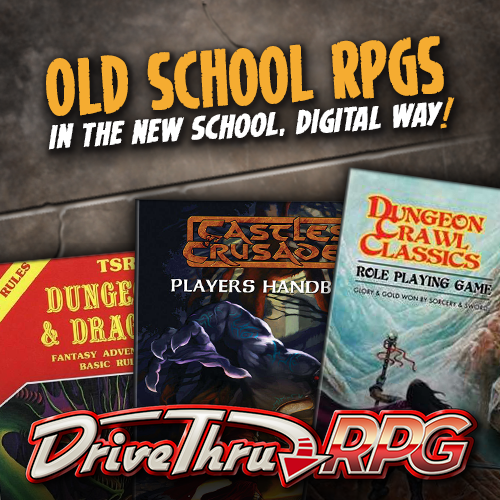 Whether you’re an OSR curmudgeon, a 5e young turk, a cardstock miniatures general, or an Xacto-wielding papercraft ninja, you’re welcome here. Please share your thoughts, critiques, and suggestions in the comments below. I look forward to our conversations, and promise to respond within 24 hours. Thanks! I will be here to see what you make! I loved the Black Pudding review!